Living Blues started as the first blues publication in Chicago in 1970 and is the nation’s longest running blues magazine. The Center for the Study of Southern Culture publishes it bimonthly. OXFORD, Miss. – Blues tourism in Mississippi is highlighted in the special October double issue of Living Blues magazine. Focusing on more than 180 Mississippi Blues Trail markers, the issue spotlights the people, places and themes of the blues in Mississippi with hundreds of destinations including clubs, museums, festivals and restaurants. The issue is underwritten with a grant from Visit Mississippi. “We have decided to revisit the blues in Mississippi and provide readers with a travel guide to the markers and some of the many exciting experiences visitors can have while driving the back roads of Mississippi,” said Brett Bonner, editor. 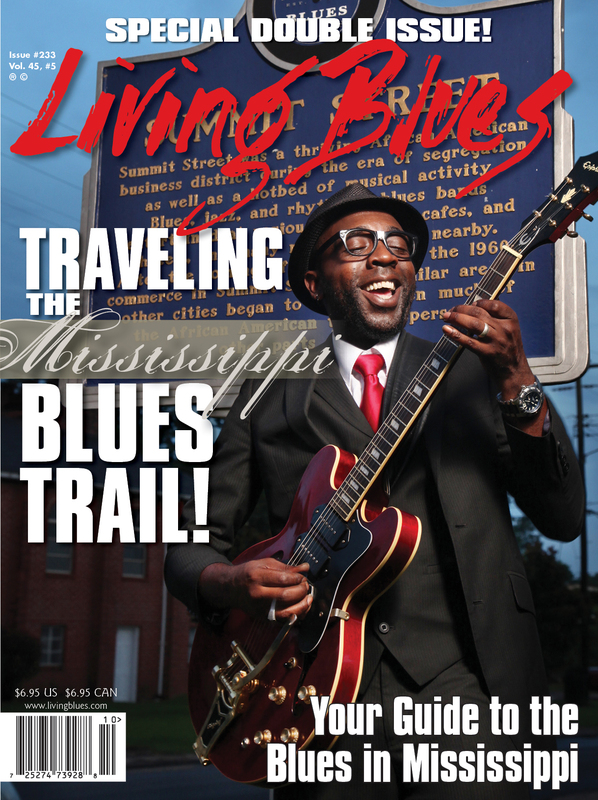 This is the second-largest issue of Living Blues ever, and the second time Visit Mississippi has collaborated with the magazine to produce a Mississippi-themed issue. Founded in Chicago in 1970, Living Blues was acquired by the university’s Center for the Study of Southern Culture in 1983. The magazine’ writers, researchers and photographers have worked with Visit Mississippi on the Mississippi Blues Trail since its inception, so it was only natural to help share the story of one of the state’s greatest tourism assets, White said. Living Blues received a Mississippi Blues Trail marker from the state in 2009, which is located outside Barnard Observatory on the UM campus. The magazine was also honored as a past recipient of the Blues Foundation’s prestigious “Keeping the Blues Alive” award. “With the generous support of Malcolm White and Visit Mississippi, I once again tapped my dynamic blues duo of writer Scott Barretta and photographer Bill Steber to tackle the project,” Bonner said. The effort of several months of hard work, 5,000 miles, 40,000 words and thousands of photos, the issue is a user-friendly guide for adventurers traveling the Mississippi Blues Trail. Using the Mississippi Blues Trail Markers as anchors, the guide identifies hundreds of destinations throughout the state, including museums, juke joints, festivals, famous gravesites and more than 100 places to eat great Southern food. This issue of Living Blues is also available as a digital edition, with songs available to correspond with each region. Downloads are available on the Living Blues Facebook page. For more information, visit http://www.livingblues.com/.